Melbourne - South Africa second-Test hero Faf du Plessis will play a single match for the Melbourne Renegades against Shane Warne's Melbourne Stars next month in Australia's Big Bash League Twenty20 competition. Renegades coach Simon Helmot said Du Plessis had agreed to play in the December 7 tournament-opening match and would be an all-round asset to the team. 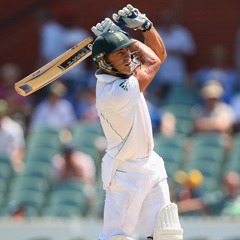 "Faf's one of the best fielders in world cricket and an explosive T20 batsman," Helmot said. West Indies batsman Marlon Samuels will replace Du Plessis in the Renegades lineup for the remainder of the season. Du Plessis scored a match-saving 110 not out on Monday's final day of his Test debut to secure a draw for South Africa in the second test.